A very common spinal condition that often results in neck pain, back pain, arm pain, or leg pain involves either pinched nerves or a pinched spinal cord in the neck (cervical), mid-back (thoracic) or the low back (lumbar) regions of the spine. This can result from a variety of underlying conditions, but is most commonly due to age-related degenerative changes of the spine, or due to traumatic events such as a fall. 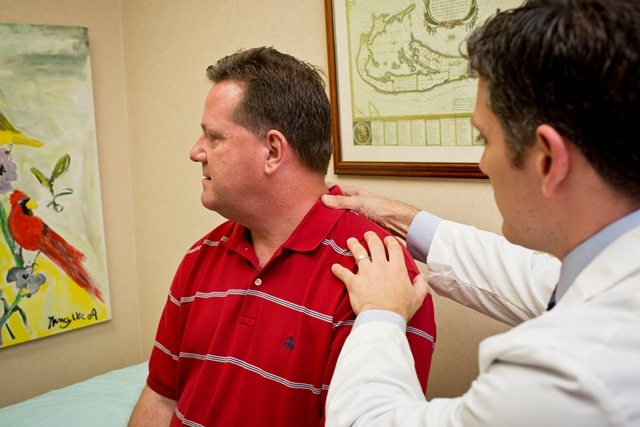 Once diagnosed (typically with an MRI or CAT scan), our board-certified spine specialist at Guilford Orthopaedic and Sports Medicine Center, Dr. Mark Dumonski, will educate you on your condition and thoroughly discuss the appropriate treatment options with you. Treatment will typically begin with a variety of nonoperative measures such as medications and physical therapy. However, in some situations, surgery may be indicated either initially, or more commonly, following an appropriate trial of nonsurgical treatments. If surgery were ultimately decided upon, Dr. Dumonski will discuss in detail the specifics of the surgery, as well as the associated risks, alternatives, and the expected recovery time. Questions are always encouraged, and if additional questions were to arise after your office visit, please call the office. A return call from either Dr. Dumonski, his physician assistant Kayla, or one of his medical assistants can be expected within 24 hours of your call. Read more on Cervical Radiculopathy (a pinched nerve in the neck) by clicking here. Read more on Cervical Myelopathy (compression of the spinal cord) by clicking here. Read more on Spinal Stenosis (narrowing of the spinal canal) by clicking here.